In May 2015 I presented my counselling journey to 3rd year students who were coming to the end of their MSc in Therapeutic Counselling at University of Greenwich. I was invited to speak with the students by the then course director Victoria Alexander. Since completing the course in 2012 I had wondered if I would ever receive the esteemed call to present my counselling journey to students. Speaking as an Alumni, I imagined would be a mark of success. It was – but not in a monetary sense. I had, at last, arrived as a mental health professional and that was worth acknowledging in the least for myself. From completing the course, it had taken 3 years to get to a point where I felt I had ARRIVED. When I was a 3rd year student I looked forward to meeting alumni who had completed the course before me and listening to their stories. In 2011 I was expectant of listening to personal stories that would inspire me to have incredible success as a counsellor. During my time on the Greenwich course there were a number of moments that stand-out. My Interview with John Lees, the first day of the MSc course, attending art therapy/drama therapy experiences, realising that I had adapted from one approach of counselling – person centred, to being an integrative counsellor. This event happened during my second year of the MSc and I will write about Laos (not the clients name) in a later Blog. Other memorable moments include; my first counselling client that attended their appointment. I practiced in a GP surgery in SE London. My 2nd counselling placement at a Prison and my first client once there. Failing a submission piece during the second year of the course and having to repeat a piece of work and resubmit, oh the shame! Entering the 3rd year of the course, engaging in a difficult conversation with a lecturer – John Nuttall on a delicate issue, completing year 3 and looking towards the top of Canary Wharf Tower on an evening in June from where I live in Lee, and whispering to myself we’ve done it, acknowledging the support of my wife throughout the three years. With the group of students met in 2015, I shared the beginning of my journey as a youth worker – basketball coach, which lead to me becoming a learning mentor and then to the world of counselling. I spoke as though there appeared to be a plan, but that would be me being presumptuous. The path to become a counsellor opened up the further I travelled along its over grown route. With each move there appeared to be a logical next step which developed, honed and remodelled my sense of enquiry. The book by Scott M. Peck A Road Less Travelled highlights the difficulties and treasures of working in the field of psychology. I happened to read the book at least 10 years before I began my training. At the end of my presentation a number of questions were asked in relation to what life is like now as a counsellor/mental health practitioner. I was able to share that for me as a professional the experience is of being creative. I shared that I had attempted to bake and bring to the presentation a sourdough bread. The bread was to be used as a symbol. Sharing the growth and development of the journey I had undertaken. I was asked by a student ‘what the lack of being able to produce a bread represented?’ My response was for them ‘to think about my lack of bread and get back to me.’ In truth I did not have a good enough answer and used wit to escape the students question. I have been working on my sourdough culture for a little over three years. 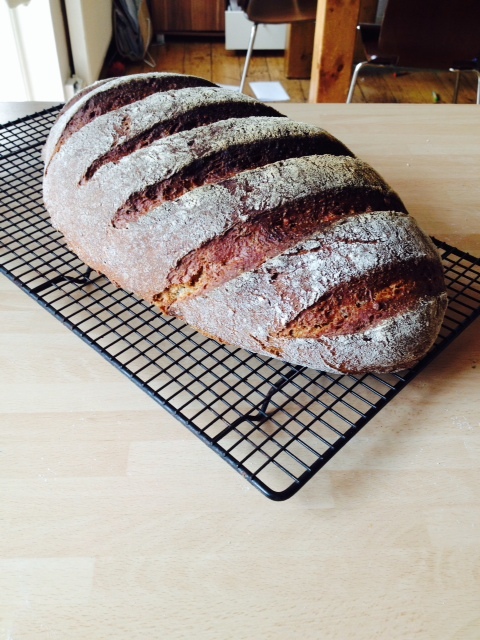 It began when I received a book for Christmas by Dan Lepard the ‘Hand Baked Loaf’ in December 2011. I bought a few Kilner jars and started as Dan had suggested. I found it difficult to throw out much of the leaven on the 6th-7th day as he suggests, but overcame my reluctance to discard hard won yeast for the greater good of the bread. The yeast culture has been successful in helping me to produce a range of breads, pizza bases, focaccia and pain aux chocolate in the 3 years I have been baking in this way. I have also had a number of failures where the leaven has not produced bread that has not risen or has not had the aeration (big air holes) that a good sourdough should have. A better response to the student’s question of my failure to produce a bread for the group, could have been to discuss the reality of failure or of not being successful when making interventions or assessments with clients. Whilst failure is an uncomfortable experience the effect of not reaching a particular point with a client can also be useful in providing information. Getting things wrong can be of use for a therapist. I learn the strength of the alliance between me and the client, and the resilience of the therapeutic engagement. In most cases there is a point for reflection. “Was that interpretation useful now, for them?” “Would a senseate reflection be of use here, how did that story go, could it be of use, now?” I also get to refocus, so as to aim interpretations close to the person’s growing sense of awareness most of the time. The other outcome is the person being supported finds a way forward which informs them of their resilience and that their counsellor doesn’t have all the answers! Sharing concepts of not getting it right in therapeutic encounters with clients, with the student in question, could have helped to deliver the analogy of not producing my bread. ‘My bread is similar to working with clients, I don’t always get it right. With time, patience, be willing to accept the failure (lack of understanding, miscomprehension, miss timed interpretation) as a reason for the therapeutic work at times missing the mark, and continuing to offer support for successful outcomes.’ This is what I would liked to have said. Continuing after a mis-step in the counselling contract can result in a better result in therapy. For me and sourdough breads the aim is to create great artisan breads like those at Gails Blackheath, Brickhouse Bakery, and E5 Bake House. Alchemy occurs in therapy and can be achieved with bread. I am glad that I have pursued the effort of crafting a good leaven that will produce great bread. Without the many failures I could not have appreciated the inevitable successes.